Hey For Old Robin! was the cry of the Earl of Essex's army during the First Civil War as, contrary to modern popular belief, Robert Devereux was well-liked by the men he led. 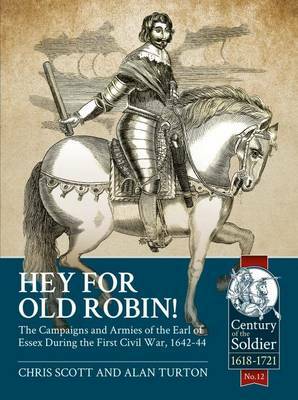 This book fills a gap in the literature of the Civil Wars, taking up the challenge to write a new history of Essex and his Army and examining the often-repeated view that he was a cautious dullard with little military skill. The two authors Christopher Scott and Alan Turton, both well known published military historians, present a more balanced view of Parliament's first Lord General, bringing him out of the shadow of Cromwell. In doing so they are not afraid to bite the bullet of period and modern criticism of Essex as a strategist and tactician, as well as his reported failings as a man. Based on primary research, including site visits to scenes of his triumphs and disasters, they trace the story of the early campaigns, beginning with Edgehill, then Brentford and Turnham Green, the relief of Gloucester and the retreat to Newbury, the Siege of Reading, the Thames Valley Campaign, the disaster of Lostwithiel and the rebuilding of the army for Second Newbury. Whilst they leave the detailed examination of the various battles fought by Essex and his men to more specialist books, they tell the story of each of the campaigns and share their thoughts on Essex's problems and his decisions and actions. They also examine how the armies were constituted, officered, recruited and maintained, as well as its reductions and transfers. In separate chapters they describe Essex's Foot, the Horse, the Dragoons, The Artillery and The Train, dealing with what the army wore, what it was paid, what weapons it used, the flags it carried and how it was organised, operated and fought. All this is set within a sound understanding and appreciation of the background of the seventeenth century and Essex's place in the socio-political zeitgeist as well as period military thinking and practice. Illustrated with a wealth of seldom-seen contemporary engravings of Essex's officers and friends and newly commissioned maps, as well as uniform and cornets & colours plates, this work is of great use to anyone with an interest in our civil wars including academics, local historians, re-enactors and wargamers.